The Civic Education Gallery of the McConnell-Chao Archives brings people in direct contact with archival material. With this engaging outreach program, the McConnell Center and the University of Louisville hope to create a greater awareness and appreciation for primary sources and their importance in documenting the past to understand the present. Though the papers of Sen. Mitch McConnell and former Sec. of Labor Elaine L. Chao will take years to process and be made available for research, the Archives contains an interactive educational facility open to the public during normal business hours of Ekstrom Library. Built around the lives and careers of Sen. McConnell and Sec. 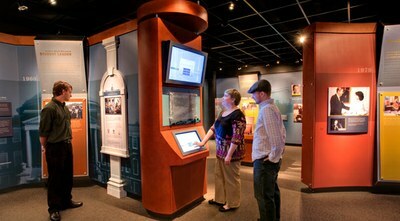 Chao, the gallery is designed to educate visitors about American government, history and politics. Free, guided tours of the gallery are available for school groups.